Start your journey to better teamwork! To help build a truly cohesive and effective team. There are many reasons why teams struggle -- low trust, unproductive conflict, lack of buy-in, little accountability --- all of which lead to low morale and poor results. 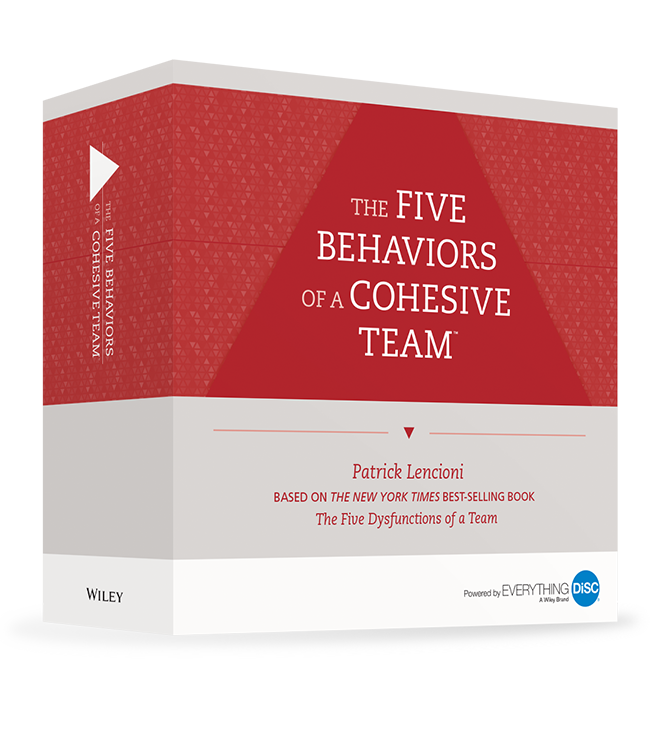 The Five Behaviors of a Cohesive Team™ is a proven model that helps companies develop teams that are highly focused on their goals and that achieve exceptional results. The Five Behaviors program uses a personality assessment to help participants understand themselves and their team members and how they can effectively work together. When you purchase the Five Behaviors Team Assessment and/or the Facilitator’s Kit, you’ll have a choice between Everything DiSC® and All Types™. Your choice determines which personality assessment the participants will take and which model is used throughout the program (Facilitator’s Kit). Both models are equally valuable in helping teams achieve greater effectiveness and productivity. The Five Behaviors of a Cohesive Team™ Powered by Everything DiSC® is based on DiSC® behavioral styles — D: Dominance, i: Influence, S: Steadiness, and C: Conscientiousness. 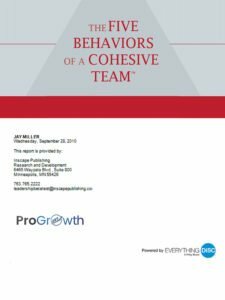 The Five Behaviors of a Cohesive Team™ Powered by All Types™ is based on Jungian 16 personality types and is MBTI® compatible. Driven by your choice of two distinct personality models, Everything DiSC® or All Types™, participants learn how their individual personality styles come together to form a better, stronger team. 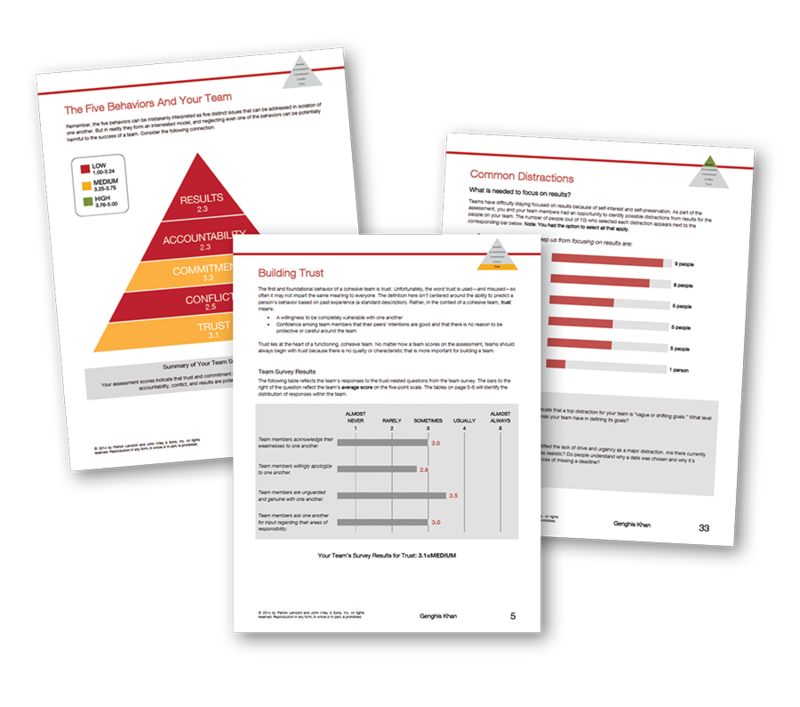 This highly personalized, comprehensive 36-page report allows each person on the team, and the team as a whole, to understand how they scored on the assessment and how to interpret their individual and team results. The profile report includes an introduction, a section devoted to each of the five behaviors, a summary of the team’s strengths and challenges, tips, and suggestions, and a road-map to help teams create an action plan based on their results. The online Five Behaviors of a Cohesive Team assessment includes two types of questions: those designed to determine a person’s Type or DiSC style, and those designed to evaluate how frequently the team engages in the five behaviors. The responses are integrated into a single, personalized report for each participant that reflects both their individual Type or DiSC style and the team’s composite evaluation of its performance on the five behaviors. Each person receives a personalized, individual report. In addition, an Annotated Team Report is included for the facilitator. This is a valuable tool that the facilitator can use in preparation for and during team sessions. This report is a copy of the actual team profile that includes scoring interpretation and expanded explanations of assessment content. The Five Behaviors of a Cohesive Team Assessment Profile can be used as a standalone assessment. Everything you need to successfully facilitate The Five Behaviors™ program. This kit includes a USB drive installed with a Facilitator’s Guide, which includes scripted sessions and experiential activities; presentation materials; handouts; PowerPoint slides with 40+ minutes of video; and sample reports to help facilitators prepare for team sessions. Team member assessment profiles are purchased separately. Create an end-to-end teamwork development program or concentrate on specific areas. Switch out video clips and modify the Facilitator’s Guide, PowerPoint® slides, and handouts. Add or delete sections to fit any time frame. You can choose from the One-Day Facilitation script for an overview or the Three-Day Program for a more in-depth team development experience. Each module builds on the previous one, helping participants see how each behavior serves as a foundation for the next. Exercises within each module give members an opportunity to begin practicing the behaviors. Personality Types or DiSC® styles are used as a point of reference throughout, allowing participants to see how their own and their teammates’ types/styles affect their work as a team. Are you ready to become an Accredited Facilitator?